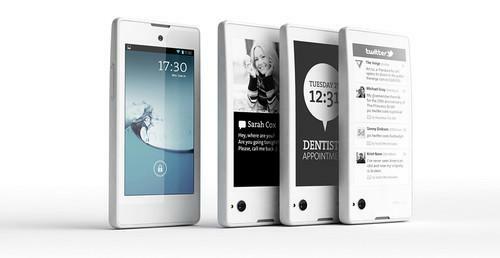 The YotaPhone is both a smartphones and an e-reader, thanks to its two screens. The €499 (US$480) YotaPhone is the first Android-based device with two screens -- an LCD screen on one side and an electronic paper display on the back. On Wednesday, the device went on sale online in Russia, Germany, France, Austria and Spain. Availability in more European countries, including the U.K., will come during December and January, according to a spokesman at YotaPhone's Moscow-based manufacturer Yota Devices. The company also wants to put the YotaPhone on sale in the U.S., but there is no firm launch date at this point, he said. The device is powered by a dual-core 1.7GHz processor and both screens measure 4.3 inches. The smartphone touchscreen display has a 1280 by 720 pixel resolution, while the e-reader display's resolution is 640 by 360 pixels. The latter isn't touch-enabled, but does have a capacitive touch zone below the screen for gesture controls. One of the advantages of the e-paper display is that it uses less power than its LCD counterpart. Users can take advantage of that not only when reading books, but for other types of content too. That's because the YotaPhone has a feature that lets users move, for example, a boarding pass or a map from the smartphone display to paper display. Despite the addition of the paper display, the YotaPhone measures only 9.99 millimeters thick. It weighs 146 grams. That compares to the HTC One Mini, which weights 122 grams and is 9.3 millimeters thick. It too has a 4.3-inch screen and a 1280 by 720 pixel display. The Yotaphone runs Android 4.2, and includes a 13-megapixel camera and LTE. There is also 32GB of integrated storage and 2GB of RAM.